While unsolved conflicts in the South Caucasus are sometimes labelled “frozen”, that is basically a misnomer: there is a volatile situation with a potential for large-scale violence. In addition to the persistent threat for human security, the situation in that part of the EU’s periphery may potentially threat oil and gas supply routes and other transportation corridors, particularly between Europe and Central Asia. Furthermore, the situation is additionally complicated by multiple antagonisms between global and regional powers. This article offers a review of the situation taking into consideration the mentioned issues and examining the current security situation in the South Caucasus within a wider regional context. The article also examines Russia’s regional interests and the attitudes of other regional actors – Iran and Turkey, and their relations with the South Caucasian countries. Concepts like cyberspace, cyber security, cyber war and other words from the same family are increasingly brought to attention either in media, public discourses or in everyday life. Probably the main reason is the high interconnection of what we call cyberspace with the real space, our everyday life. We are living a double life, one in the virtual space and the other in the physical one. But what would be the role of the state in this constellation? Are the characteristics of a state influencing the level of cybersecurity? Our aim in this article is to identify some of the factors that have an impact in the cyberspace. We will proceed by presenting the approaches on cyberspace in the selected countries. After that, we will continue with selecting the data for the chosen variables and we will effectuate the preliminary analyses of the selected data. Afterwards, we will move to the individual interpretation of the results, correlations and graphics. Pension Funds are a novelty in the global arena and certainly an innovation in the newly established Kosovo pension system. After the 1999 conflict, first the international community and later the Kosovo authorities have undertaken state and institution building efforts in order to normalize all sectors of social and institutional life. To date, the Kosovo authorities have progressed in the process of the establishment of actual Pension Funds. However, they are still facing challenges in implementing the newly established legal framework, setting up the institutions, and establishing adequate processes related to the functioning of pension funds. In 2015, the Kosovo authorities signed the Stabilization and Association Agreement with the European Union (EU) as the first step towards the still-distant prospect of EU membership. As such, the Kosovo authorities need to undertake comprehensive and deep reforms of its legal and intuitional framework. The main purpose of this paper is to identify the advantages, risks and challenges of integrating the EU DB and DC concept of Pension Funds in Kosovo as a part of its efforts towards EU integration. Through a comparative approach of the EU DB and DC concept of Pension Funds and the newly developed pension schemes in Kosovo, I aim to answer the question: is it possible to implement the very high standards for Pension Funds developed by the EU in post-conflict Kosovo as a part of its efforts towards EU integration? The main findings of the paper will show how the socio-economic and financial problems of post-conflict Kosovo impact the core of pension funds as envisaged in EU pension fund schemes and how the goal of EU integration impacts the development and implementation of pension funds in Kosovo. EU, pension funds, pension, Kosovo, Define Benefit and Define Contribution. This paper shows how Russia framed the annexation of Crimea from the securitisation theory perspective, with a focus on the shared past as the key argument. This paper discusses how the idea of shared past in general and the concept of brotherhood among nations in particular were utilised to justify the annexation, along with how the Crimean discourse was framed for the domestic Russian consumption. This includes an analysis of why a shared past is so important to the Kremlin, how this was applied in its foreign policy approach and later justified the annexation and the various methods the Kremlin used to win over public support. Brotherhood of Nations, Crimea, Russia, Securitisation, Shared Past, Russia. The present paper aims to analyse the recommended evaluation practices at EU level and their possible implications on the results and recommendations formulated at the end of the evaluation process. To do so, I have built a model for analysing the theoretical assumptions behind the evaluation practices, and applied it to reports and TORs of evaluations requested by the European Commission regarding the Cohesion Policy in the 2007-2013 financial perspective. Here, one might ask: Why is it relevant to know and analyse the theoretical assumptions behind evaluation practices in general and those recommended at European Union level in particular? By including certain criteria in the terms of reference, different interest groups (in this case the European Commission, representatives of national, regional and local institutions, non-governmental organizations, representatives of the private environment, etc.) decide what can be considered as valuable or not. Compared with what authors Hoerner and Stephenson (2012) have found regarding the evaluation practices that covered the Cohesion Policy in the 2000-2006 financial perspectives – a predominance of the positivist paradigm in evaluation practices, this article concludes that the dominant paradigm between 2007 and 2013 is that of realist evaluation. Both the analysis model and the results obtained after applying to eight Cohesion Policy work packages are detailed in this article. This article investigates the acceptance of securitizing narratives by different professional and age-based audiences in Romania. Through analysing the results of a q-sort questionnaire created and administered by the National Institute for Intelligence Studies, the article argues that different audiences relate very diversely to narratives of risk. The article begins by outlining the development of the theory of securitization and its transition to include a focus on audience acceptance. Further, the article describes the Romanian 2015 Strategy for Homeland Defense as a key “tool” of securitization. Finally, the article looks into the differential acceptance by distinct audiences of different risk narratives outlined by the Strategy, as discovered through q-sorting. Results show that older people fear Russian expansionism and that governmental employees reject the idea that bad governance is a risk to security. EU CRISES AS ‘CATALYSTS OF EUROPEANIZATION’? For the last decade, the EU was confronted with an unprecedented series of subsequent and often overlapping crises – the constitutional crisis, the Euro crisis, the massive influx of migrants and refugees and last but not least, the Brexit referendum. They were all very different in structure, but they had a common element – they put to test the European Union’s (EU) legitimacy. The main assumption of the study is that these recent crises in the EU directly influence the debates in the national public spheres, and affect the way in which solidarity among EU citizens and EU states is imagined and enacted in media. Thus, the study aims to explain variation in the Romanian public opinion for the period 2014 to 2017. 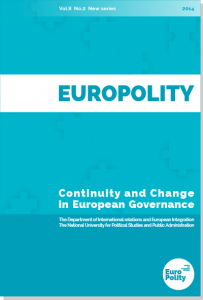 It identifies exogenous factors that relate to the EU polity, its policies and national politics and how they shaped public debate in Romania around two main Pan-European crises – the refugee crisis and Brexit. The paper discusses the impact of the two crises on the Romanians’ level of trust in EU institutions and assesses possible causes of this ‘superficial Euro-enthusiasm’ on the overall context of the Europeanization of public sphere in Romania. The findings are discussed in light of three main conditions of a Europeanized national public sphere: the role of Romanian media in building EU legitimacy; very high levels of polarization and contestation around the 2 topics of common concern; and a clear ‘European dimension’ that transcends national topics. Brexit, European Union; European public sphere, Europeanization, refugee crisis, Romania.